MK Ahmed Tibi tries to stop police from arresting a young rioter. Radical Arab Knesset Member Ahmed Tibi, a former advisor to Yasser Arafat, played a part in the large-scale violent Muslim riot in the Negev Saturday. A video aired by an Arab television channel – and proudly posted by Tibi on Facebook – shows him trying to prevent the detainment of a boy who had taken part in the violence. Tibi can be heard shouting at police, "He's a boy... you are inflaming the atmosphere... you should be ashemed of yourselves." Other rioters shout "you are racist! ", a very popular refrain among Arabs engaged in confrontations with Israeli law enforcement. 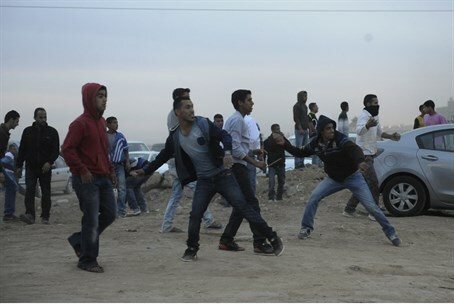 Tibi was present at the largest protest on Saturday's "international day of rage", on Highway 31 in the Negev, where over 1,000 Muslims threw rocks at police forces that arrived at the area and blocked the thoroughfare. According to eyewitness reports, police used tear gas and water cannons in response to the attacks, and Bedouin blocked the highway with burning tractor tires. Police Spokeswoman Louba Samri told AFP that "ten policemen were lightly hurt and 11 protesters were arrested" during the clash. Among the injured was Coastal Region Police Commander Hagai Dotan. Later figures put the total injured number of injured police at 15, and total number of arrests at 28.